Chief Minister Pema Khandu today dedicated the much-awaited Aalo-Pasighat-Roing-Tezu 132-kv transmission systems to the service of the state. Deputy Chief Minister Chowna Mein and Power Minister Tamiyo Taga jointly launched the project that stretches from Aalo to Pasighat at 77 km of transmission lines built by the state power department. The line further stretches from Pasighat to Tezu via Roing at 174-kilometers, which is built by the Power Grid Corporation of India Limited (PGCIL). The project also includes 2×5 MVA, 132/33-kilovolt sub-station at Dura Korong, which was commissioned by the Power Minister. 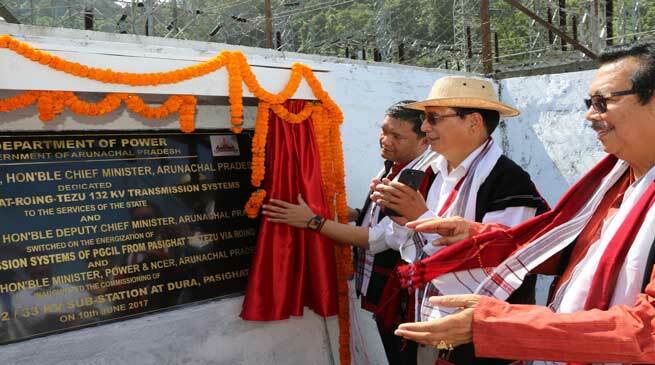 The Deputy Chief Minister switched on the energisation of the 132-kilovolt transmission systems of the PGCIL from Pasighat to Tezu via Roing. Power Minister spoke over the hotline in Roing to confirm the supply of electric power, which received positive affirmation. “The work for power transmission system started in 2005 but got delayed in the following years,” said the Chief Minister in a simple function held. However, after he took over as Chief Minister, Khandu informed that he had issued clear-cut instruction to the power department to make the project operational by summer of 2017. He thanked the officials of the power department in getting the work completed in the stipulated time and also thanked the DONER Ministry for funding the project at the cost of Rs 70 crore. “The line is capable of transmitting 150 megawatts of electric power in its first phase, and its capacity will be doubled in the future,” said the Chief Minister. “This project is crucial to ensuring the supply of electric power with reliability, quality, stability and sustainability, which will benefit 1800 villages covering over 5 lakh people,” he said and added that it will greatly improve the economy and living conditions of the people. The Chief Minister said the inauguration of the 133 kV power transmission line today is another testament of the state government to complete all unfinished projects in the state. He further announced that the works on 95-kilometers of transmission lines for remaining stretch of Tezu to Namsai will be completed in four months time. Earlier Agriculture Parliamentary Secretary Tatung Jamoh and Disaster Management Parliamentary Secretary Kaling Moyong jointly launched the two interconnecting transformers at the sub-station. The inaugural was also attended by State BJP President Tapir Gao, RD Minister Alo Libang, Advisor to CM Lombo Tayeng, MLA Kento Rina, Commissioner Power Ashis Kundra, Chief Engineer A Perme, Pasighat DC Tamiyo Tatak, Power Grid General Manager Ajay Patir including top state BJP party officials.